If your child is an artist, or has a creative side, you should encourage your child's creativity through the gifts you give. I have compiled a list of gift ideas targeted toward the young artist. Costs are included in the descriptions. Jump to the end for a suggestion of where you can buy these gifts. Some gifts listed here are of the tried-and-true variety, some are different and unusual. All will help develop creativeness and expand the imagination. This is cool. Age unlimited, this is a battery operated, handheld device that you plug into the A/V jack on your TV. Point it at anything and view objects at up to 200 times normal size, right on your TV screen! If you can keep the adults away from it, this interactive toy will give your young artist an up-close perspective of everyday things. The cost is around $40. Great for toddler to adult, these little paint containers are 3 ½" tall and come with inner safety lids, brush rest, and colored caps with matching color brushes. There are 10 of these containers in the set and they really work! Tip them over and they don't spill! This set of 10 colorful containers with caps and brushes goes for around $20. When you go someplace, your child can't leave their creativity behind. This lightbox is a great size to take along for the ride. The organizer case is 8.25"x9.5"x3.25" and features a pull out palette and storage compartment. The fluorescent light (for tracing) runs on AC power or 6 AA batteries. This is a creative alternative to the handheld video game for those long trips. Priced around $35. A great gift for the older child, this beautifully-packaged Sumi E calligraphy set comes in a fan-shaped case in the Japanese tradition. The set includes 5 natural hair brushes (5" long) and brush stand, a slate grinding stone and ink stick, a water bowl and ladle and a soapstone seal. I recommend you purchase a sumi-e book to go with this as no instructions are included. However, once your young artist gets into Sumi E, they'll love it! Price for this set is about $19-$25. It is what it says. One side of this easel is a chalkboard; the other side is a white magnetic wipe off board. It's an easy flip and change from one to the other. It's about 18" x 15" and easily folds for storage. Great table top easel for the youngest of artists. Cost is around $20. If you would like to help your young artist, but you are not an artist yourself, this is a great kit. The lessons here are taught by Jon Gnagy. Self-taught, Jon was America's television art instructor. He was quite popular among children. Along with the step-by-step instructions and over 200 illustrations, this set comes with four art pencils, three sketching chalks, sketch paper, lap top drawing board, kneaded eraser, shading stump and sand pad sharpener. Recommended age is 8-up, but that's up to you. I believe the price is a steal at $16. I still have my first easel, I still use it, and I still love it! What a beautiful, low-priced full size easel for the young artist. This nice, possibly first-time easel comes with a dry erase/washable marker surface that's 16 1/4"x23". It also includes a 12" paper roll holder and a 100' roll of paper. There is also a tray for supplies. This is a nice, sturdy wooden easel your child is sure to love! Perfectly priced around $55. Is your young artist a 3-D type person? Creative minds love this stuff! This award-winning modeling material is used like clay, but it's more versatile. It air-dries and won't stick to clothes. It has kind of a spongy feel while you're using it, and when it dries, you can paint it, color it, glue it and decorate it to your heart's desire. There are hours of fun to be had with Model Magic. This pack comes with fourteen .5 oz. bags of Model Magic in 9 colors: white, blue, yellow, green, red, black, orange, purple and brown. It also comes with ten project cards. About $14. 9. Jumpstart Artist: Best Seller Junior Series (XP / Mac), from Knowledge Adventure All of the JumpStart software is a hit with kids. JumpStart Artist teaches the young artist all about the world of art through games and interactive activities. They even create their own pieces of art! They'll learn about the basics of art, artwork, styles and design, as well as gaining knowledge of some famous artists. This one is recommended for children ages 5-8, but I've discovered firsthand that children both older and younger enjoy just about any JumpStart Adventure. Priced around $24. ...Or any Roger Burrows pattern coloring book. This recommendation is number 10 and the least expensive, but in many ways it could be the best. It appeals to all ages, and if you can keep this away from the grown-ups, your young artist will gobble it up in no time. I've seen two people working on this at once, it's so attractive and addicting! 100 pages and many hours of coloring fun! Dynamite price at around $7. Well, there you have it! My list of 10 great gift ideas for the young artist in your world. Encourage and nurture the creativity in your child. You might just find yourself having fun at the same time! All of these and more are available at the canvas and pen store for artists. Kick back and motivate! Canvas and Pen, http://www.canvasandpen.com offers relief for artists and writers who have encountered creative blocks. Get inspiration and motivation from articles and features specifically designed to inspire the artist and writer. Got a creative block? Relax. Kick back and motivate! MP3 players are fun holiday gifts the kids will love! Do you have kids on your holiday shopping list? Kids love music and they just want to be like the bigger kids -- so give them a unique and fun gift they'll love: their own digital music player. This article features the top 3 MP3 players for kids this Christmas. These popular, kid-friendly music players will entertain, delight, and help them grow into smart young adults. They're easy to use and won't break your wallet. And they're not all just for kids -- you might even want to pick up one of these budget players for yourself! Music is not only "fun" but it's also been proven to be therapeutic and practical. Research has shown that music helps children develop stronger learning skills. So this year, give them a fun and unique gift that will make them scream in delight (while also being good for them). The Kid-Tough FP3 Player is a real digital player designed just for preschoolers. It's tough enough and easy enough for kids to use. They've also made it easy for parents to download songs and stories onto the player from the Fisher-Price FP3 Song & Story Online Store, or from any CD you already own. Kid-tough design that stands up to the way preschoolers play. Holds two hours of entertainment--that's approximately 30 songs or 15 stories. Preschoolers will be grooving to their own beat with this handheld, portable music player. Kids pull out a special downloading cable and plug it into the side. Then they can download the pre-loaded songs while making their own playlists. And it has a fun feature -- the Music in Motion mode starts and stops the music with your child's dance movements. And the convenient carry handle makes it easy to carry the fun along. You can pick one up for about $33. Groove to your favorite tunes with the help of this teeny tiny player, priced at about $40. Jazzed up in your favorite Disney theme, it features 512MB of internal memory -- that means you can boogie for up to eight hours with WMA-file songs or up to four hours with MP3-file songs. With the Disney Mix Stick digital music player, you can play music right away with Disney Mix Clips-full Cds of music on tiny SD cards! It's easier than downloading; no computer required! Just plug and play! Whichever option you choose for your kids, nieces, and nephews -- they're sure to be thrilled and excited with these fun holiday gifts. Please visit our website for holiday specials on these featured MP3 players and more. You can also get personalized jewelry or a doll or teddy bear - making it an extra-special gift! It makes a great gift for any child who is interested in astrology, or science in general. They will treasure it for years to come. You should realize that this is not recognized by the scientific community, and that the star is not actually owned by you. The star name is published in a book called "Your Place in the Cosmos". Get Them Disney Movies, And Save! Stuck on what to get the kids for Christmas or their birthday? Why not get a gift that lasts? By joining the Disney Movie Club you can get three titles for only $2.99 and then get a DVD per month. The good thing about this program is that you get a fixed amount and they don't send you a DVD that you have to return. Plus, right now, they can get a free Disney watch! 1. Choose three Disney DVDs for your introductory offer of $2.99. These would be a great gift on Christmas morning or at their birthday party. 2. Every month you'll get a mailing with the number of units you still have to get and a suggested selection of title. 3. Once you have fulfilled your membership agreement you can continue or just stop. This means they can get a movie a month for 3,6 or 12 months depending on how long you sign up for! Disney movies are the best when it comes to family entertainment, and this is a gift you can all enjoy! Got to the Disney Movie Club for more details. Yes, I know there are lots of lists around but I do think they are coming together with the Nintendo Wii, Webkinz and Transformers being the big toys this year. Lydia Quinn goes into a bit more detail than others on why this is so. In years past, shoppers have trampled each other for the last Tickle Me Elmo doll or the latest video game console. So what are the hottest toys and games in 2007? Let's look at what's selling this year. The #1 toy this year isn't technically a toy. It's the Nintendo Wii video game system. The Wii is the latest console from Japanese maker Nintendo. Nintendo is known for quality of gameplay and the family friendliness of their game lineups, ease of use and game controls. The Wii is different from other video game systems, like the Sony Playstation and XBOX 360, mainly due to the controller. The controller is completely different from any other system available. The Wii controller consists of a remote that is motion sensitive, so that when you swing the remote like a tennis racquet, golf club or sword, you are controlling the character or action on screen. This type of controller is a major innovation and incorporates lots of physical movement into video games, where before there was virtually none. The Wii is also family friendly, with many games that kids and adults can play alone or together. In fact, the Wii has brought video gaming to the masses, where it's not uncommon to see whole families, spanning multiple generations playing a game of Wii tennis or bowling. In addition to the actual Wii video game system, there is no doubt that other hot items will include Wii games, including the massively popular and critically acclaimed Super Mario Galaxy, Guitar Hero III and Paper Mario. Still, probably the most popular Wii game of all, is free and comes with every Wii console system. That game is Wii Sports, and includes baseball, tennis, bowling, boxing and golf. This handheld magnifier is one of the biggest sellers this year. The Bionic Eye is basically a handheld device that magnifies and illuminates whatever you point it at and then transfers that image to your TV screen. It magnifies objects up to 200 times, so you can point it at just about anything and see even the tiniest details, including bugs, fabric, hair, food, and even your own skin. While few families don't have a Monopoly game in their home, this isn't the classic version most people have. This is a completely updated version with new game pieces and new properties. Gone are the 4 railroads and in their place are major US airports. Gone are the utilities, they are replaced by cell phone and Internet companies. Gone are the shoe, old car and hat, all replaced by pieces like a jumbo jet, coffee mug and cell phone. In this Monopoly edition, the prices are all updated too, where Baltic Avenue used to be just $60, it's replacement, Texas Stadium is now $600,000. Sound like too much change? You'll be glad to know that the original Monopoly is still available. This digital camera made for kids has large rubberized grips on each side to make it easy for kids to hold and super easy to use controls. It can also take up to 120 photos or even up to 5 minutes of video footage. The camera can also be hooked up to a TV with included cables, so that you can view photos and videos on a big screen. 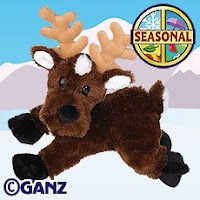 WebKinz are basically a stuffed animal, but what makes this stuffed animal different is its connection to the web, hence the name, WebKinz. Each plush critter comes with a special code that then allows the child access to an online game and community where they can create a virtual version of their WebKinz character and interact and play with other members. The movie broke records earlier this summer, so understandably this increased interest in the original toys from the 1980's and also in the new versions of the toys. Favorite characters like BumbleBee and Optimus Prime are certain best sellers this year. Holiday shopping can be fun, frustrating or simply one more task that needs to get done. Regardless of whether you enjoy shopping or not, finding gifts that don't just please your kids, but allows you to enjoy the fruits of your labor with them is truly worth the effort. This season, bypass the lines and check out these cool gift ideas that you can buy safely and conveniently online, that allow you and your kids to have fun together. More often than not, it's the gifts that make memories that are truly treasured. Whether its sitting around the fireplace playing a game of dominoes with Grandpa or helping Mom in the kitchen make festive cookies, kids like spending time with family members regardless of the age. Sure the latest video game may be high on the list of priorities, but holidays aren't just about wish lists and spoiling our kids. It's about spending time, stepping out of our normal routines and doing something fun and memorable with our loved ones. This season, you create a holiday to remember by leveraging some truly fabulous gift ideas. If you're looking for considerable savings on children's toys that will not only be a hit with your kids this holiday season, look no further. Make-a-Plate Kits are not only memorable gifts, but it encourages time well spent with your kids. Together you can create unique and one of kind plates that signify the holiday or a special event. Likewise, Illustory books are another remarkable gift that will be a fun pastime, as well as a treasured masterpiece. These unique books allow your child to tell their own story where you can see the personalization and creativity of your child come to life. Professionally bound and typeset, this is an excellent gift idea for children who love to read and write. Kids Gardening Tool Set is perfect for those kids who love the outdoors and like spending time with nature, plus it creates more time together doing things as a family. For those children that are more into computers and spending time indoors, Webkinz is the latest trend in plush toys. These adorable stuffed animals are collectible characters that come with their own identification code, that when entered into the website creates a virtual world starring their stuffed animal. Toys clothes put on the stuffed animal also appear on the virtual version. The virtual world is designed to teach your child about responsibilities in care taking by rewarding them with points for feeding, walking and cleaning up after their virtual pet. Shopping online for gifts that inspire kids to learn as well provide entertainment that you can all enjoy is convenient, affordable and safe. Not only do you benefit from lower prices and time management, but items can be delivered to your door and all the information is available at your fingertips. From books to musical instruments, science projects to dolls and doll houses, you can find just about any toy online and usually for a fraction of the cost that big box retail stores boast. Rather than circle the parking lot searching for a spot, check out Toys2Wish4.com, a wonderfully fun online toy store that has a variety of cool toys and fabulous gifts to choose from. Whether you're looking for top brand manufacturers such as Lego, Mattel, Tomy, Tyco, Breyer, KidKraft, or the highly coveted brands like Anatex, Doug & Melissa, Alex and Webkinz, you'll find chests full of fabulous toys and gift ideas for the holidays. Sam Brown is a personal shopper for clients nationwide, specializing in online shopping. This article talks about gift ideas for children featuring learning toys, activity toys and children's toys for kids of all ages. We see a lot of advertising and hear a lot of stories about adult video games. Normally, you have to kill something to get to treasure, or kill someone to win the war, or kill someone to solve the puzzle. Well here are the top 10 kid-friendly (including big kids!) video games at Amazon.com right now. Mario Party DS (DS) - Beat Bowser in the race to the crystals! New Super Mario Bros. (DS) - Run, jump, and stomp your way through raging volcanoes, tropical islands, snowcapped peaks, and unimaginable challenges! Interesting that they are all a Nintendo system! Technology has enabled new areas of play for children of all ages. Interactive toys, in particular, open discovery opportunities that past generations could not imagine. The days of G.I. Joe, Barbie and board games fulfilling children's playtime activities seems to be a thing of the past. Today's kids are tech savvy and need hi-tech interactive games that supply instant gratification. Sure, little boys still love to play with their trucks in the mud, while little girls dress their dolls up for tea dates, but today children are computer smart. But that's anything but negative; the best part about them - children are developing their minds and sharpening their intellect while they play games! As a parent it's like getting your cake and eating it too. Now if you could just get them to eat their vegetables! The best toys for children are indeed those that are interactive and foster learning and playing in one. Interactive toys give children the opportunity to explore, talk, and learn while having fun! The fourth annual "Hot Holiday: Toys, Game and Video Games" survey from Play-Date, a marketing service firm, found that little boys will be asking for more video game and interactive toys this year then in years past. With the popularity of the Leapfrog Learning System, educational games have never been so much fun. These learning tools are turning to the TV in a video game format to teach children the basics like colors, animals, the alphabet and more. Today, industry shifts have now moved to computer learning games as well. One of the most popular interactive toys, if not the most popular of 2007, Webkinz, have taken the industry by storm like none other since the Tamagotchi's craze in the 90's. They are adorable stuffed animals that transport kids into a world of virtual friends, fun, learning and game playing! Visiting their kid-friendly website, children get to play educational learning games, visit with friends and learn responsibility by taking care of their virtual pet. If you haven't seen one yet, just wait. And if you're a parent with a child who has one, we know you're playing right along with them! Big brothers and sisters are volunteering to help out with the Webkinz just to get a crack at the secret code to enter the Webkinz world. Following Webkinz has been a whole assortment of interactive computer related games for children like the Lil Kinz, Shining Stars, Ty Girls and Zoobie pets. While parents might be slow to adapt to kids tech savvy learning of the 21st century - no imaginary friends, less board games - interactive games and toys are an asset to your child's learning and development. Gift them with education by introducing them to the newest developments and latest technologies in learning fun! PamelasBoutique.biz carries tons of interactive toys at low prices, including Webkinz and Shining Stars. That darling child in your life will have a huge smile on their face when you present him or her with a cuddly interactive plush toy!